Kulikovo Field (Russian: Куликово поле, or Kulikovo Pole; lit. "snipes' field") is a field in Tula Oblast in Russia where the Battle of Kulikovo took place on September 8, 1380 and was won by Dmitri, who became known as Donskoy (of the Don) after the battle. Memorial column on the Red Hill, erected in 1848. As established by Stepan Nechayev, the battlefield is located between the rivers of Nepryadva, Krasivaya Mecha, and Don some 140 km away from Tula and 23 km away from the Kulikovo Pole railway station. 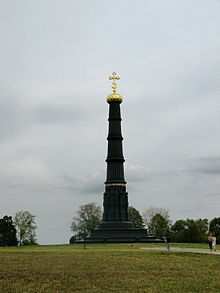 Today, Kulikovo Field is home to a museum complex which includes a 28-metre high column on the Red Hill (Красный Холм) built between 1848 and 1850, and a memorial church in honour of Sergius of Radonezh (built from 1913 to 1918 according to a design by Alexey Shchusev) that is now the Kulikovo Field Museum. 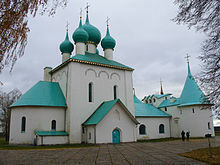 There is a stone church in the nearby settlement of Monastyrshchino (Монастырщино) where, according to a legend, the fallen Russian soldiers were interred after the battle. No burials have been found so far, which poses a puzzle for scholars who estimate that the battle claimed up to 200,000 lives on both sides. This page was last edited on 13 December 2017, at 07:24 (UTC).